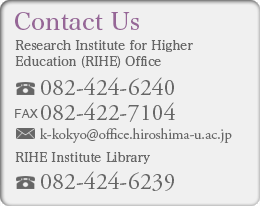 The Research Institute for Higher Education (hereafter, RIHE), Hiroshima University undertakes surveys and research that contributes to the advancement and reform of higher education systems and individual institutions. “RIHE Open-call research” provides higher education researchers from outside RIHE with the opportunity to pursue cooperative research with RIHE’s academic staff to deepen the understanding of the educational and research productivity at universities. Through this RIHE “Open-call” research initiative, RIHE seeks to fund collaborative research projects to help meet these goals. Applicants should fill out the Application Form and send with all the necessary documents by email to k-kokyo@office.hiroshima-u.ac.jp. All applications must reach us by 6 May 2019.